Hello and thanks for stopping in! Today I am sharing a card inspired by the Altenew class Beyond Basic Backgrounds, specifically the lesson on Foiling Stamped images without a Laminator. I do own a laminator but I've heard about this technique and was excited to give it a try. I began by prepping a 5.5" by 4.25" piece of Neenah card stock with anti static powder-my Stampin' Up embossing buddy I've had for eons ;). 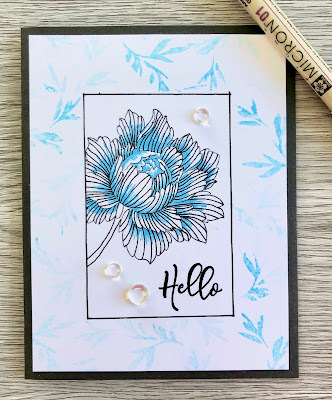 Next I inked the outline stamp from the Winter Rose stamp set with Versamark ink and randomly stamped around the card stock. 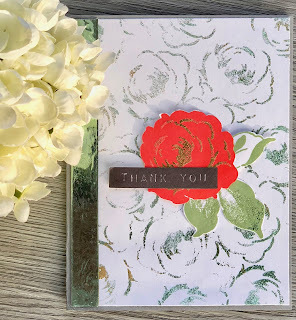 I sprinkled Ranger Sticky Embossing Powder and heat set. I then placed mint foil over the entire panel and burnished with my fingers. You can see from the photo above I got so-so results. I re-heated the embossed portions and placed gold foil over top, again burnishing the foil. 1. Use a stamp positioning tool to stamp each image 2-3 times to ensure you have lots of ink for the embossing powder to adhere to. 2. Once you've completed all the stamping, hit the images with a bit of heat before attempting to add the foil. 3. 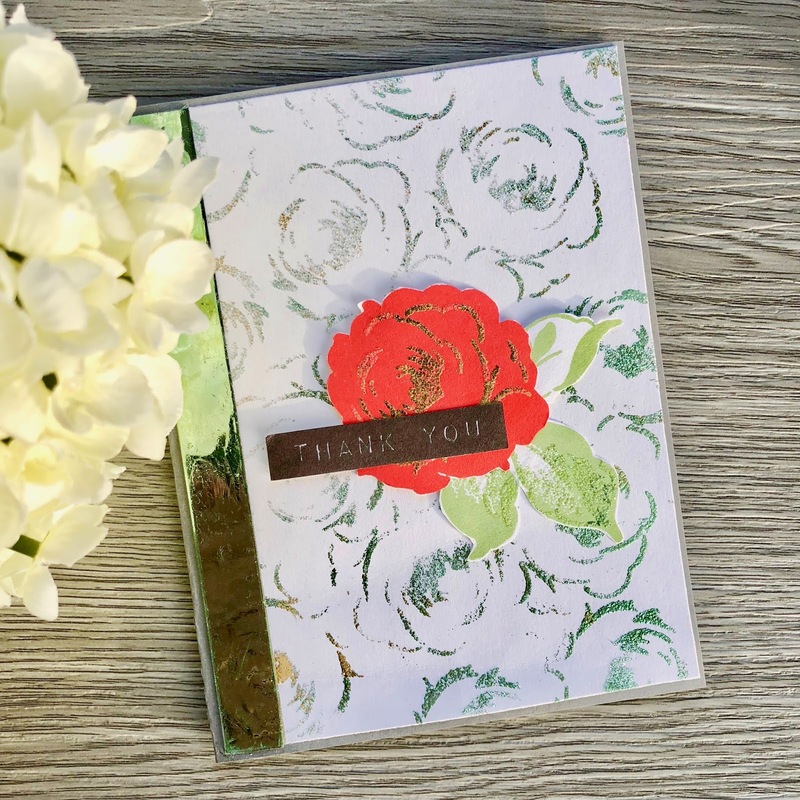 Run the card stock panel with the foil placed on top through an embossing machine. You'll have to add extra card stock "shims" between the panel and top and bottom plates to increase the pressure. This will also help adhere the foil to the sticky embossing powder. 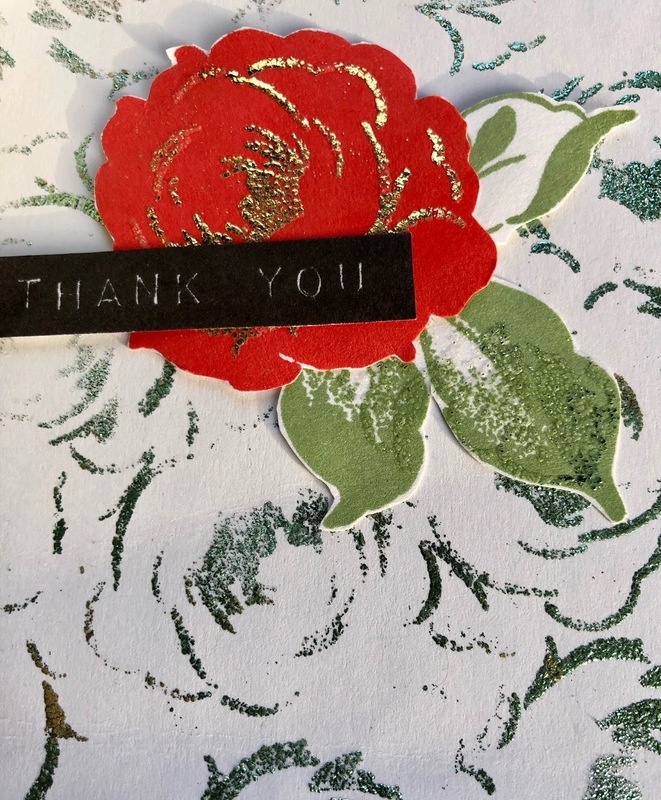 I stamped the base stamp from the Winter Rose set in Heartbeat Altenew Crisp Dye Ink and the leaves in Forest Glade Ink. I then used one of the detail stamps for the rose and leaves, following the same process as the card base. 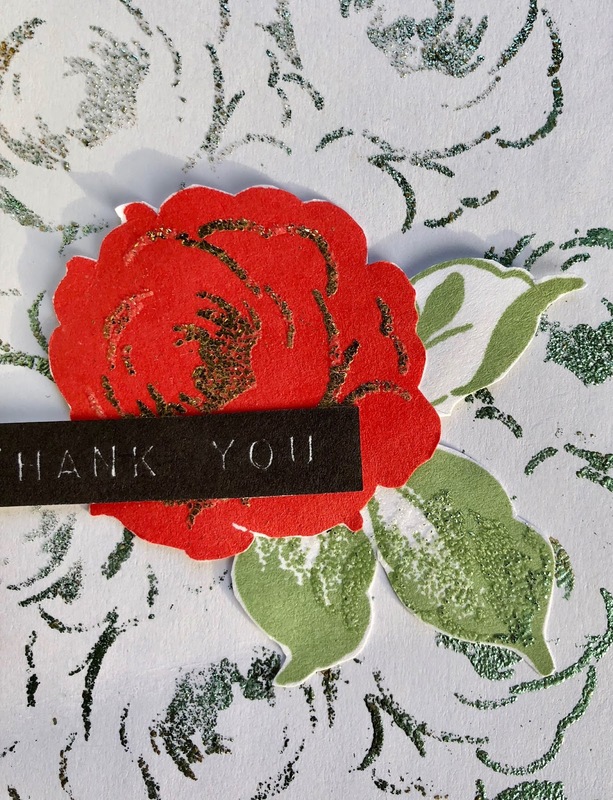 The flower is foiled in gold while the leaf is foiled in mint. The left side of the card front is edged with half inch double sided tape to which mint foil is adhered. 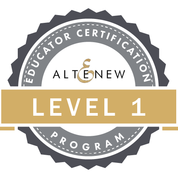 A sentiment from the Altenew Label Love set completes the card. I really love the shine from the embossing! The popped-up flower makes a huge statement in this! Beauitufl project, Rosie!